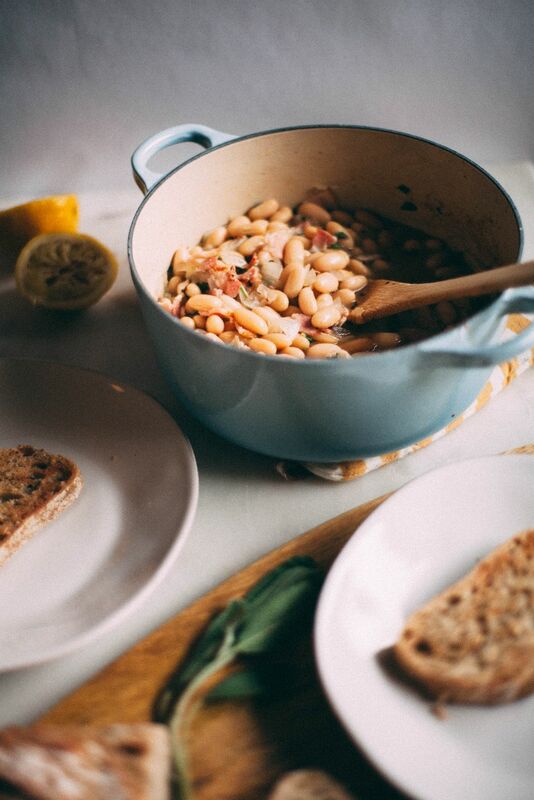 I’m sure the title of this blog post is mildly cringe-y to my British friends out there, who eat beans on toast the right way. And I fully understand the blasphemous implications of this recipe. But let’s just pretend this is just beans AND toast. And not beans ON toast. Because what’s in a name really? It’s beans! It’s toast! It’s really really good, and they only take about 15 minutes to throw together. There’s so many variations of this recipe, that yes, I tagged it as vegan and vegetarian, because if you eliminate the bacon, it’s just that! And if you want to use a different herb, be my guest! Or let’s say you want to add a fried egg on the top, which in that case, let’s be best friends. 2016 was hard, y’all. But this recipe is a close second. Geez, I had no idea what I was getting myself into. But it is so good/fun to make. Want to impress someone? Make gnocchi. 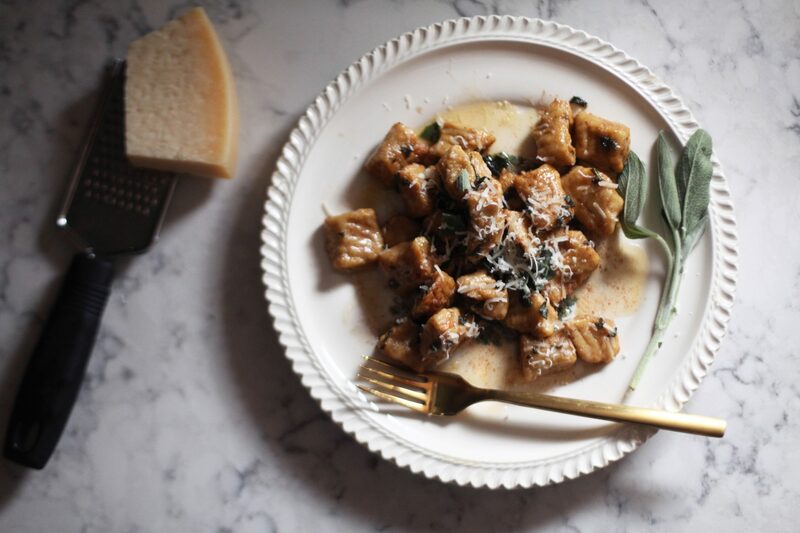 Want to REALLY impress someone, make sage brown butter sauce for the gnocchi. Done. 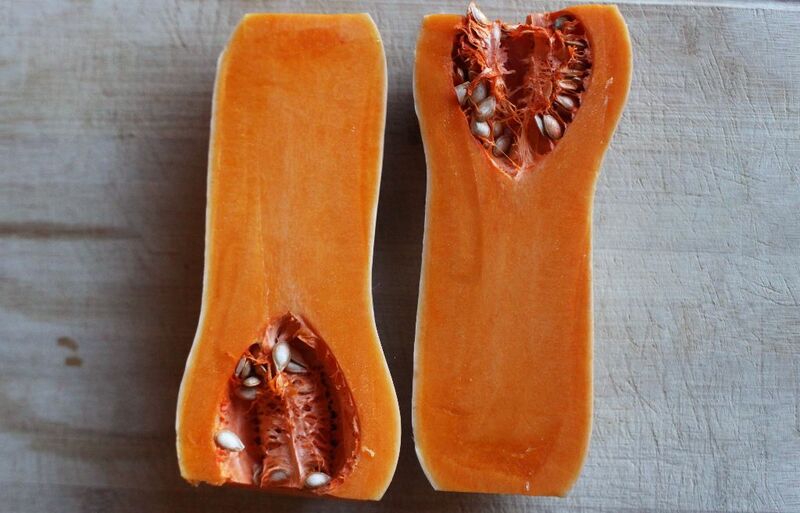 You halve your squash. Scoop the seeds. Roast FOR. EVER. Go read a book while doing this. Or work out. It takes awhile. It’s going to get all brown and bubbly and you can pierce it with a fork easily. Scoop the flesh out of the skin. Then you’re going to boil a huge potato. Push it through a wire mesh strainer with the back of a spoon. It will look like snow. I’ve never done this, so I was very impressed. Puree the squash. Then heat the squash in a medium saucepan until it thickens and the juices evaporate. 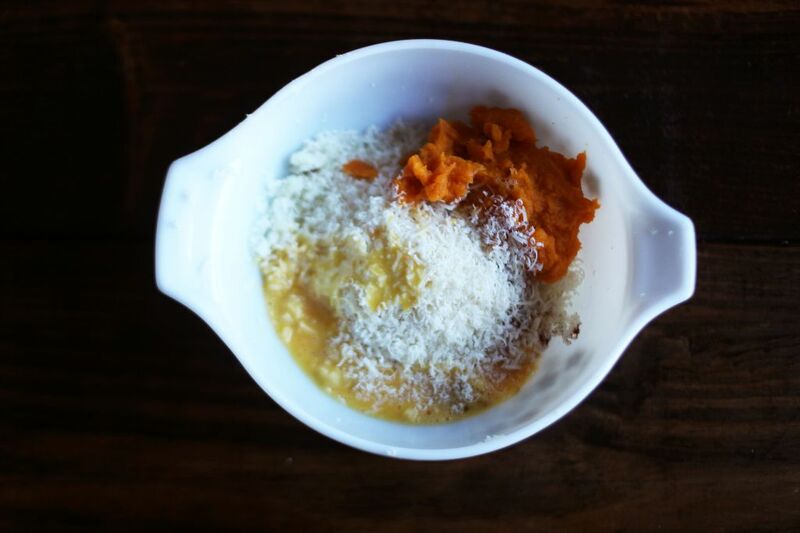 In a bowl, you’ll stir together the potato, squash, an egg, nutmeg, parmesan, and salt. Then you’ll slowly add flour, kneading together the dough with your hands while you do this. The recipe called for 1 3/4 cups of flour, but I really only needed about 1 1/4. 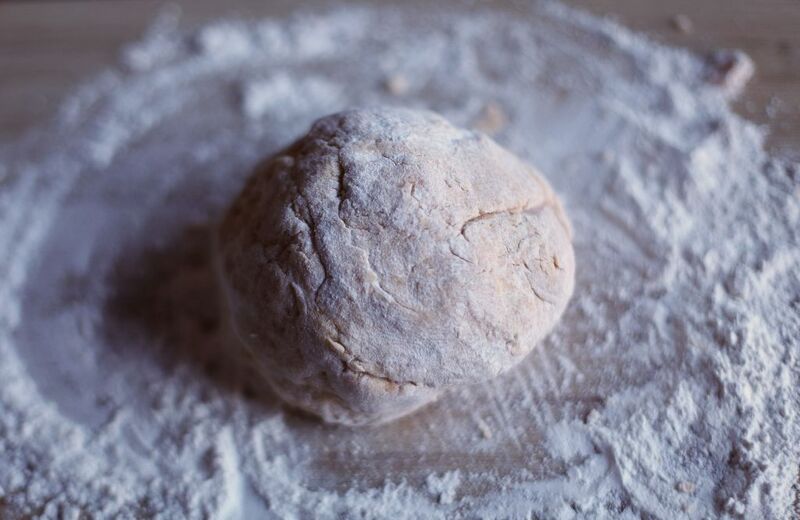 Your dough will start looking like this planet below. Cut it into 8 pieces and roll like play-doh into a snake. Then cut into 3/4″ pieces. Roll the gnocchi over a fork to give it some texture. Then chill on a parchment covered baking sheet wrapped in saran wrap for an hour. Then you’ll boil those guys in batches for about 15 minutes. Chill again. WHY! Because you have to. Then you can make your sauce, add the gnocchi and eat. I need a drink after typing this post. Challenge yourself! It’s 2017! 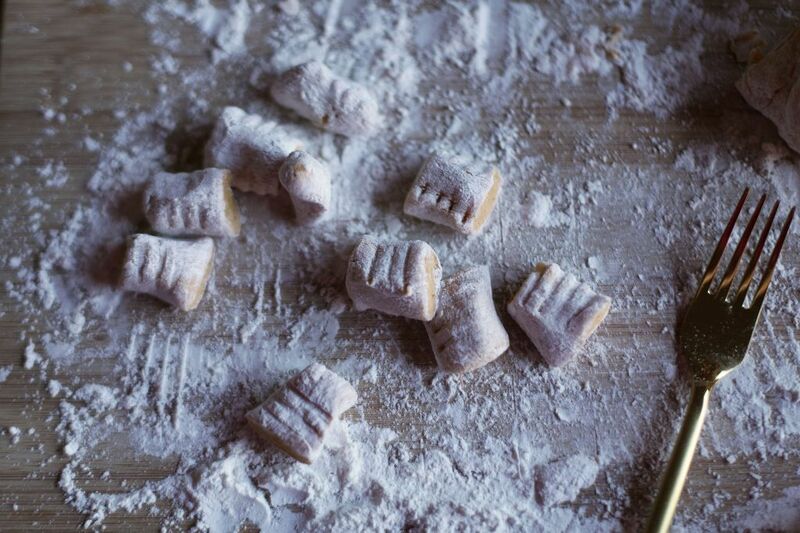 Make the gnocchi with friends on a Saturday. Then eat it! Preheat oven to 400 F. Cut squash in half longways. Scoop out seeds into the trash. Place squash cut side up on a baking sheet and drizzle with olive oil. Bake in the oven until browned and bubbly and it’s pierced easily with a fork about 1 hour- 1 1/2 hours. Cool. 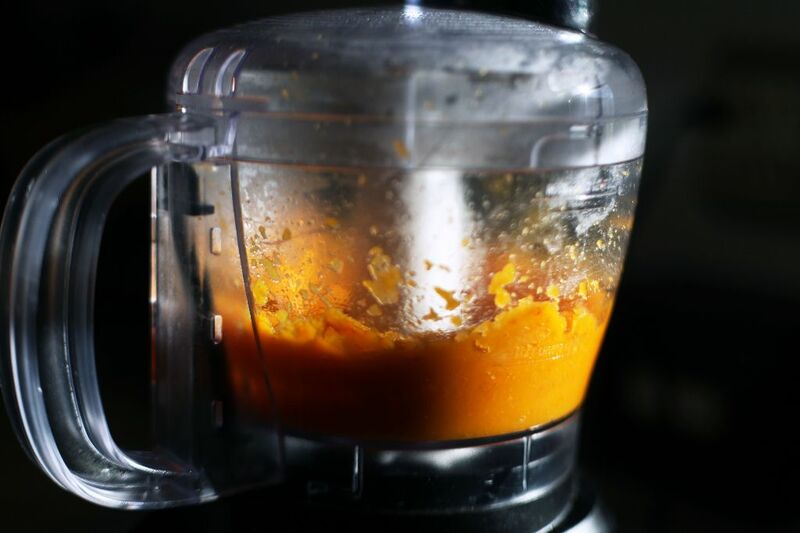 Scoop flesh into a food processor and puree. Transfer to a saucepan over medium heat, stirring constantly until it’s juices evaporate a bit, or about 5 minutes. Cool. Measure 1 cup of the puree. Cook potato in a saucepan of boiling salted water until tender (20 minutes). Rain. 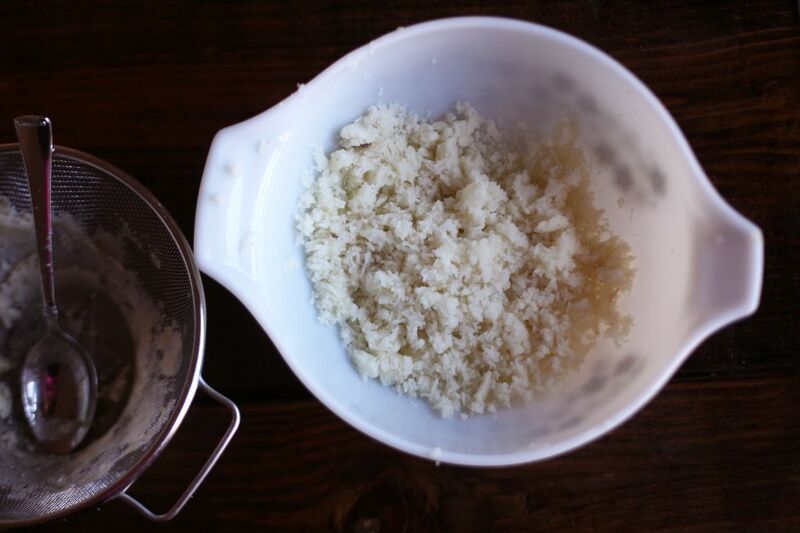 While potato is warm, press through a metal strainer with the back of a spoon or a potato ricer. It should look like snow. This should make about 2 cups. Mix squash, potato, 1/2 cup parmesan, egg, nutmeg, and salt in a large bowl. Add the flour gradually, kneading with your hands until dough holds together nicely. Turn out onto floured surface and knead for a minute. Roll the dough into a ball and cut into 8 even pieces. Line two baking sheets with parchment or wax paper. Roll each of the 8 pieces into a long snake (like play-doh!) about a 1/2 thick. 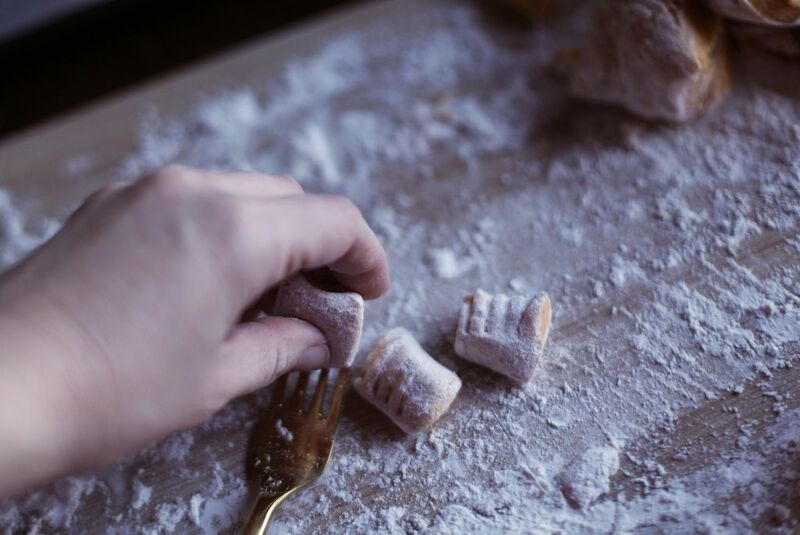 Then cut the rope crosswise into 3/4″ pieces to make your gnocchi. 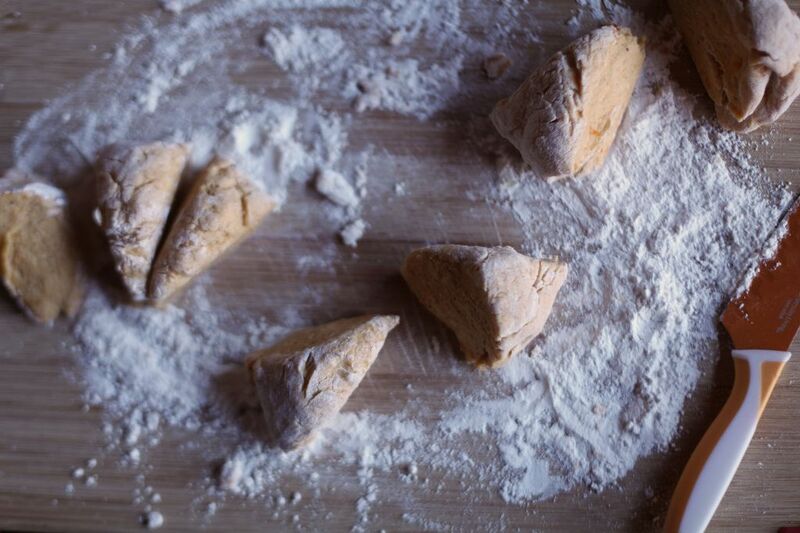 After each piece is cut, roll the gnocchi over a fork to give it texture. Place all the pieces on the parchment, cover loosely and chill for an hour at least. I let it chill overnight. When you’re ready, boil the gnocchi in two batches for 15 minutes. Drain and place each piece back onto the parchment until you’re ready to cook the sauce. You can cover and chill these until then. For the sauce you’ll melt the stick of butter over low heat and let it begin to brown slowly. Stir in the sage. Stir in the gnocchi. Eat with fresh parmesan grated on top.